Following a year of studies at the University of St Andrews as a Bobby Jones Scholar, Emory graduate Kadiata Sy is named to the 2017-2018 Luce Scholars Program. Learn about Emory's internal nomination processes and selection criteria for national scholarship and fellowship programs. Register to attend these sessions or receive additional information. General Scholarship Information Session: Monday, March 13, 5:30-7 p.m., White Hall, Room 206. Designed for sophomores, juniors and seniors, this session is also open to undergrads, grads and alumni at any level. This session features general information about nationally competitive awards like the Rhodes, Marshall, Fulbright, Goldwater, Beinecke, Truman, Luce and Carnegie programs. This session is for current juniors and seniors and recent alums who plan to apply next year (Fall 2017) for the Fulbright, UK-specific awards (the Rhodes, Marshall, Mitchell, Gates and Churchill Scholarships), and/or the Schwarzman Scholars Program. 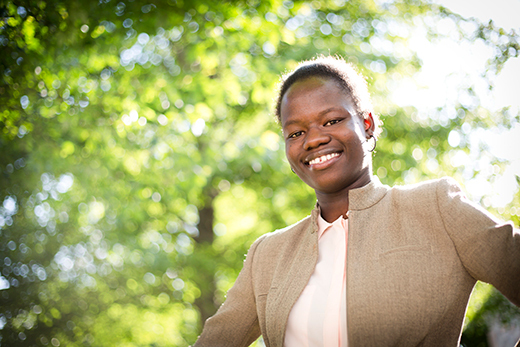 For Kadiata Sy, graduating from Emory in 2015 with a bachelor’s degree in politics and Middle Eastern studies was far from the academic finish line. In fact, it was yet one more step along what has been a true global journey. As one of four Emory seniors named to receive the 2015-2016 Robert T. Jones Jr. Scholarship, Sy left campus eager to plunge head-first into a year of studies at the University of St Andrews in Scotland. There, she would pursue a one-year master's degree in Middle East, Caucasus and Central Asian security studies — a thrilling opportunity for a young woman from Mauritania who’d spent her early childhood in a West African refugee camp in Northern Senegal. Now Sy has been named to the 2017-2018 class of Luce Scholars, an honor that will propel her even further into the world of international studies. A nationally competitive fellowship, the Luce Scholars Program was created by the Henry Luce Foundation in 1974 to enhance the understanding of Asia among potential leaders in American society. As a Luce Scholar, Sy will gain new perspectives and cultural insights through immersive living and working experiences in Asia coordinated through the Asia Foundation. The prestigious appointment provides stipends, language training and individualized professional placement in Asia for 15-18 Luce Scholars each year, and welcomes applications from college seniors, graduate students and young professionals in a variety of fields who have had limited exposure to Asia. The fellowship is unique among American-Asian exchanges in that it is intended for young leaders who have had limited experience of Asia and who might not otherwise have an opportunity in the normal course of their careers to come to know Asia, according to the Luce Foundation. Sy was among 18 students chosen for the program from among 161 candidates nominated by 68 colleges and universities across the U.S. Selected through an intensive three-month-long selection process, Luce Scholars have backgrounds representing virtually every field other than Asian studies, according to the foundation. “The Luce Scholars program has become increasingly competitive, and so we are thrilled to have an Emory alum and Bobby Jones Scholar recognized in this year’s competition,” says Megan Friddle, director of national scholarships and fellowships program in Emory’s Office of Undergraduate Education. “The opportunity to work on issues related to gender and human rights in Asia will certainly enhance Kadiata’s academic scholarship; she also brings a unique perspective that will enrich her host community and fellow Luce Scholars in return,” Friddle adds. When last we heard from you, you’d just been named a Bobby Jones Scholar and were about to graduate from Emory. Where are you now on your academic journey? My Bobby Jones year has been a great journey of self-discovery and constant adventures in Scotland and around Europe. I graduated from St Andrews on Dec. 1, 2016, and have been awarded a master of literature in Middle East, Caucasus and Central Asian security studies. My studies at St Andrews focused on political ideologies and my dissertation title was “Rationalizing Politics: Is Ennahda’s New Approach to the Question of Religion and Politics Indicative of an Ideological Shift?" I am currently pursuing a second master’s degree at the School of Oriental and African Studies (SOAS), University of London. My program title is master of arts in Islamic law — I am specializing in the harmonization of Islamic law and the human rights discourse. What compelled you to apply to become a Luce Scholar? How do you envision this contributing to your future plans? The Luce was first brought to my attention by my mentor Scott Kugle, associate professor of South Asian and Islamic studies at Emory, after I told him I was interested in gaining work experience outside my current academic field. I believe the Luce Scholarship will provide me with an enriching work experience in the field of women empowerment to further direct my doctoral studies. How does all of this fit into your Middle Eastern and South Asian (MESA) studies? I applied to Luce hoping to have a comparative regional analysis and to expand beyond my MESA scholarship. You’ll spend part of your Luce year working with an NGO that is part of the Asia Foundation’s Law and Justice Program or the Women's Empowerment Program? Yes, I am currently working with the Asia Foundation to find an organization with a mission of women empowerment. In the past, you’ve talked about working as a human rights advocate and eventually entering the field of law. Where do you see the Luce experience taking you? I hope the year with Luce will enable me to direct my doctoral studies and provide me with the work experience necessary to accomplish a fruitful PhD research experience.